I originally blogged about this topic in May 2011 on my old blog – Wholesome Cook. Today I was messing around on the blog and found the old blog post, I’d kind of forgotten about my old blog. So I re-read what I’d written with great interest. As an experiment, I took the original shopping list and ran it through the same online shopping website. The results are very interesting. So is it true? Is it more expensive to feed a family in August 2013, compared to May 2011? Read on to find out. Last night on Twitter IrishFoodies & @takeonefamily posed the question, could a family of 4 be fed in Ireland for less than €56 per week? This is a question that is very close to my food budget. At the moment our fuel bill, which includes heating and car fuel for the hubby to/from work is larger than our weekly food bill. As the fuel costs go up we have to scrimp and save on our groceries. So how do I feed our family on such a low amount? I shop locally and use our weekly Farmer’s Market for fresh fruit/veg. I’ve struck up a great relationship with our butcher which helps too. He will happily point out the cheaper cuts, draw my attention to a special offer and offers me more value for my money. We have started to grow our own vegetables which helps cut down on the fresh food bill and the frozen/preserved bill as well. We benefit from friends and family also growing their own and keeping hens so it’s rare we have to go out and buy a tray of eggs. I also bake our own treats – cakes, biscuits and cook from scratch where I can as it works out cheaper. Please don’t see this as a preachy blog-post. Far from it. Feeding a family frugally is hard work. I certainly wouldn’t be able to do it if I was working fulltime although I know of some wonderwomen who do. 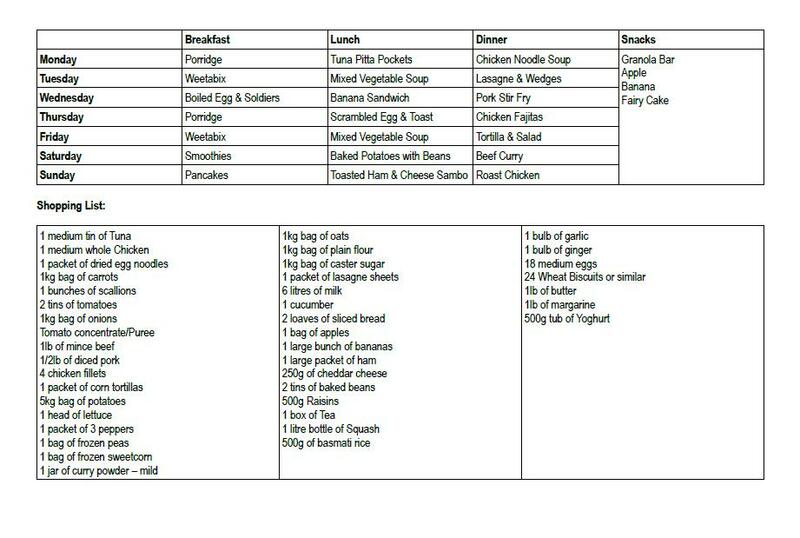 I have a basic meal plan that I stick to when working out what we will eat for the week and what I have to shop for. This very morning I ran the shopping list through the Tesco online shopping site and it comes to €70 excluding delivery. If you must shop in the supermarket you could cut this bill further by shopping between 7-8pm and picking up special offers on fresh food that won’t be sold the next day such as bread and fruit & veg. You will also notice that the dried/frozen goods will last for at least 2 weeks so you won’t have to buy them every single week. Buying branded goods costs a lot of money if you are supermarket shopping. It’s far cheaper to buy the own-brand supermarket items so bear that in mind if you’re testing the shopping list. My total shop today in August 2013, came to just under €85, compared to just under €70 in May 2011. I’m rounding them to the closest Euro. What’s interesting is that I’ve specified some pack sizes in my original blog post. When I went searching for the sizes this time, the weights and sizes were smaller. For example, I can’t buy a 250g block of cheddar but I can find a 230g block. I’m no scientist or researcher but I can definitely say that this amounts to an increase in these particular groceries of approximately 21%. I would also suggest that the increase in grocery cost is more, considering the decrease in pack size. From a personal point of view, I have noticed the increase in shopping costs. I’ve definitely noticed the same. And there’s a lot more obscuring of cuts going on. Lots of things that used to be sold by the dozen for example are now sold in 10s. Like eggs! Yes exactly. It’s driving me mad. It’s very hard to quantify the actual grocery increase taking into account the product shrinkage. LOL Hazel. It had never occurred to me to use it as a blogpost either. I figured I’d just check it for the craic, I expected an increase but not the combination of the high increase and the shrinkage issue combined. I’ve really noticed my money isn’t getting us as much food these days. Wow, some increase alright! That shows the real rate of inflation. I’ve never believed the official stats of 5% inflation per year. More like 10-15%! Meanwhile, salaries and social welfare keep on shrinking, leaving our buying power in tatters. Very worrying. Thanks for making us more aware and for your great blog! Only discovered it recently and I find it very well written and researched. How is the new book getting on? I’ve never believed the official statistics either. I had an inkling that it was a bigger increase. The more surprising figure for me was the decrease in pack sizes though as it’s insidious increases. Very hard to quantify without a couple of hours work. The book is going great thank you. All written & shot so it’s now with the publisher and we’re going through edits. Loads of work to do but I feel like the biggest part is done anyway! Yes, I had read somewhere about this practice dreamed up by the marketing companies to raise the prices in a stealth manner. The thing is, people aren’t that dumb and they do work out very quickly that they are getting less for their buck… Anyway, we’ll have to beat them at their game by shopping smart. Like a lady I know says: let’s shop on the outside aisles (where all the fresh produces are) and avoid the inside aisles (where all the processed, rubbish food is) and notice how your shopping bill reduces dramatically! I know it’s very frustrating. I’d tend to agree – the official shopping list seems to be at a constant. Thanks April. I was a professional “organiser” in a former life so I guess it just translates to the house now! Yep, definitely noticed this as well, especially on packaging size. Sometimes it’s obvious, sometimes it’s subtle. For instance, Oxo cubes, same packaging, but the actual cube is now the shape of an X, cutting out some of the product. Packaged meat (which I don’t buy unless I’m stuck and the butchers is closed) used to be 450g or 1lb, now 400g. Same prices. It’s mad. Yes because 454g is lb. Oxo is very subtle. More air in cereal packets. It has mainly slipped under the radar I’m afraid.